With Paths Of Glory, Stanley Kubrick laid bare the absurdity and cruelty of war through the callousness of French Generals treatment of their own men. With Full Metal Jacket, he sought to specifically deal with the transformation of young men into killing machines, as exemplified by Sergeant Hartmann: “Your rifle is only a tool. It is a hard heart that kills.” He found the key in what he described as the “tremendous economy of statement” of Gustav Hasford’s short novel, The Short Timers. 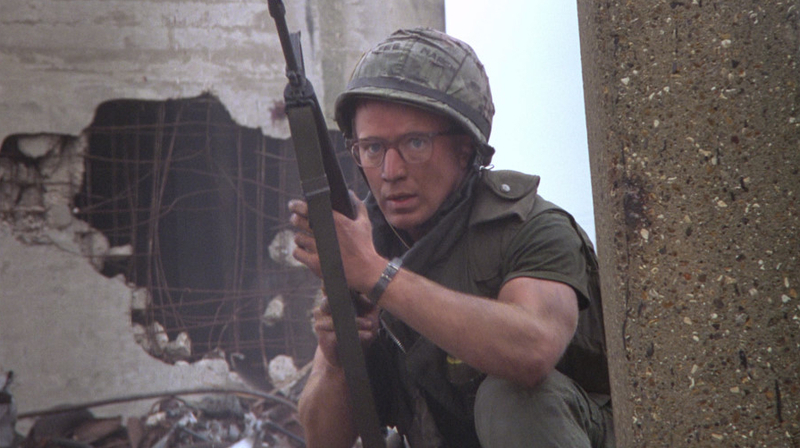 Hasford was a combat correspondent with the Marine Corp in Vietnam, and Matthew Modine’s character Joker was shaped by his experiences. 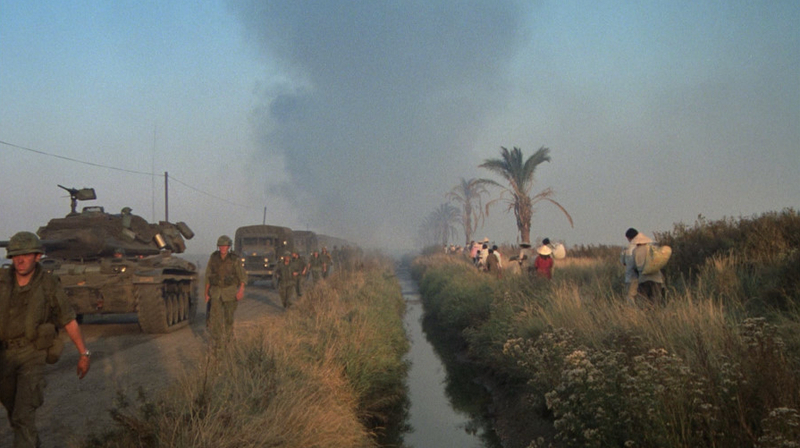 Kubrick signed up another ex-war correspondent, Michael Herr, the writer of the narration for Apocalypse Now. They worked together on the script in what Herr wryly described as “one phone call lasting three years, with interruptions.” With Kubrick, on any project the script is always fluid. One thing he loved, despite his reputation for repeated takes, was improvisation, and actor contribution, so long as it was good. Kubrick had expressed interest in Matthew Modine for the main role of Joker, and Alan Parker, his director on Birdy, sent him video tape of him performing. But it was only when he saw Modine finished at the end, just “being”, that kubrick saw what he wanted: a certain stillness, a wry observation of his surroundings. Modine had recommended an old friend, Vincent D’Onofrio, for the role of gormless Leonard, aka Gomer Pyle (after the initial introduction, none of the marines are referred to by their actual names. The fact that they retain their nicknames or adopt new ones suggests a part of their old identity has been subsumed by the “lean, green, killing machine”). The resentment Joker begins to feel for Leonard as he baby-sits him through training (he never refers to him as Pyle, even after the ”blanket party” beating, suggesting an unwillingness to bend completely to brutality) spilled over into Modine’s own feelings towards his friend. He believed Kubrick, with his long, endless retakes, was manipulating his actors into fully inhabiting their roles. “If I were directing a movie, wouldn’t I employ similar tactics?” he mused in his book, Full Metal Jacket Diary. The recruits are like insects, scuttling around the polished floor. Later, in Vietnam with green combat gear and hugging the blasted urban landscape, the transformation will be complete. As if they are cockroaches, the only survivors of the apocalypse around them. After the harrowing training segment (albeit with a scarily hilarious turn from Ermey), the sequences in Vietnam are full of grim humour. Although Joker’s John Wayne act (“A day without sunshine is like a day without blood”) is shaken when the NVA attack his base during the night. 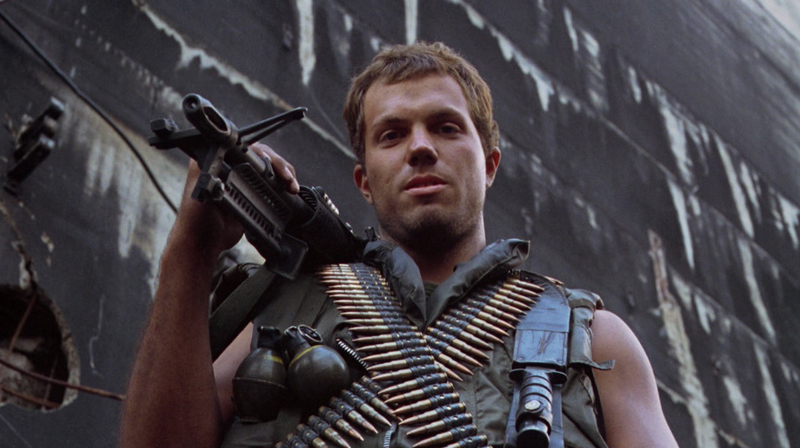 Perversely, the Vietnam sequences were shot first, and it was here that Kubrick encouraged Modine’s Wayne impression. In the novel, he and Rafterman, his photographer, hook up with his old pal Cowboy and the Lust Hog squad in a cinema, mocking John Wayne’s film, The Green Berets, full of “the phony tough and the crazy brave.” In the film, they meet in a courtyard, and Joker and Animal Mother (Adam Baldwin) square off as if they are overgrown schoolboys, albeit Lord Of The Flies style – armed to the teeth, with no parental control. As Crazy Earl says, revealing his “friend”, a dead enemy soldier, “We’re jolly green giants, walkin’ the Earth, with guns!” A comment as much on U.S military / industrial power swamping Vietnam, and latterly Iraq. Interviewed during a lull in fighting by a CBS news crew, the squad offer up their thoughts on the war. Joker lulls them with a seemingly cultured take on his enforced “tour” – “I wanted to meet interesting, stimulating people of an ancient culture, and kill them. I wanted to be the first kid on my block to get a confirmed kill.” I talked in my piece Kubrick The Klown? about “the Jungian thing”: Joker, to the indignation of a Colonel, wears a piece button and has “born to kill” scrawled on his helmet. Jan Harlan, Kubrick’s brother in law, states that Kubrick, without explaining it too broadly, wanted to suggest that everyone in the film wore a mask, to survive, to get through what war requires them to do.